There are currently 65.8 million displaced people around the world who have had their education forcibly disrupted. That's 65.8 million people without access to the skills, knowledge and connections to move themselves forward in life. We are taking the benefits of non-formal education to refugees and displaced people across Europe - creating safe spaces for learning and connection for people who have had their education forcibly disrupted. We create spaces where people can share knowledge, skills, and advice, bringing communities closer and creating pathways into new friendships, further education, employment and training. Between 2015 and 2017 1.5 million people headed to Europe, having fled war, poverty and climate change in their own countries to make new lives in safety. Every country in Europe is taking a different approach to supporting incoming migrants and refugees and as a result many people are not able to access good education: things like language to help people access services, vocational skills to find work, cultural skills to navigate a new society and social skills to make new friends. Without these many refugees end up lost, alone and marginalised on the edges of a world they can't reach. At the same time many Europeans are feeling helpless and marginalised themselves. At a time of economic uncertainty and globalisation, tensions are rising around the continent as people feel unwilling to make room for newcomers who they feel are taking away resources from them. 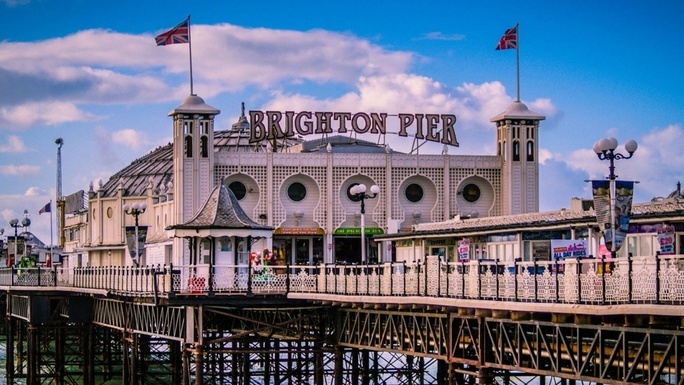 This year we're heading back out on the road, leaving our hometown of Brighton and traveling back along the refugee routes of Europe, this time in a transit van, with our inflatable pop-up classroom and two volunteer teachers - Alon and Melissa. Here they are! We need to raise £25,000 to power our team around Europe for four months and to support them as they travel. We want you to be a part of this journey - contribute to our campaign; help us find resources and make connections; volunteer your time and learn how to share your skills; meet us along the way to hand-deliver your contribution. Together we can all learn how to Make Room for each other and thrive. Check out the perks on the right-hand side of this page! If you are a business we'd love you to invest in us! We have some excellent packages to get your logo on our mobile classroom and train up to 20 members of your team. You can find out more about investing here. 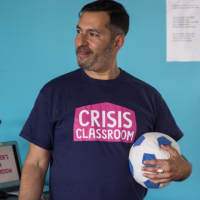 Or if you'd like to start your own fundraiser page follow this link to get all you need to raise money by hosting your own Crisis Classroom lesson. Download the instructions, invite your friends and spend some time having a new learning experience together. Thank you so much for your support! With your help we can start a global movement and bring education to people who need it everywhere. In 2015/16 we built our first project in the Calais refugee camp. 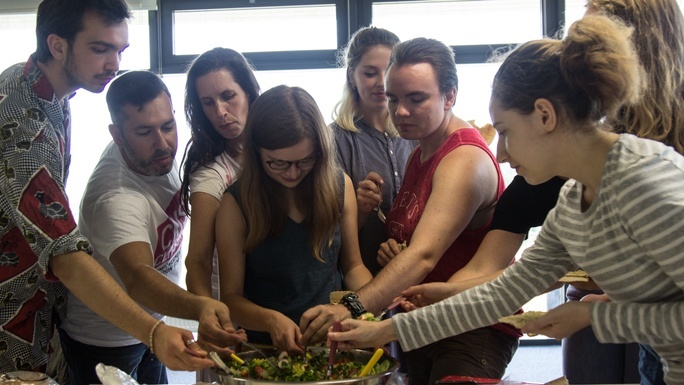 In one year we developed a teaching methodology on the ground with refugees, a training programme which trained 56 volunteer teachers, raised £45,000 through crowdfunding and converted a double-decker bus into a mobile school. We are building a movement that will empower people everywhere to share their skills, start a project and positively impact the education and development needs of displaced people everywhere. We want to break down the barriers between people by training them to teach and learn side by side. At the same time we will up-skill volunteers in host communities and create opportunities for meaningful contact between cultures. Click here to find out more about training opportunities. Crisis Classroom is registered as a charitable fund under the auspices of Prism the Gift Fund, UK charity no. 1099682. Did you know that 1.5 million refugees in Europe don't have access to quality education? We’ve got a plan to take skills-based learning where it's needed most. We want you to join the journey. We'll send you a personal message from the road, put your name on our Wall of Fame on our mobile classroom, send you an invitation to our Welcome Home Event in Brighton during Refugee Week 2018 (18-24 June) and invite you to a live Q&A with our team en route. Take part in our 'Day One: Building You' training at Brighton University on Friday 16 February. Our training will prepare you to teach your skills to others. Day One will focus on understanding yourself so you can show up successfully for others. For the length of the Crowdfunder get 'Day Two: Building Resources' thrown in free! In this training you will create your own lesson and plan and learn when and where to teach them. Once you've done both days of training you can head out and join Alon and Melissa on the road. If you can't make it to Brighton you can come to another training near you as soon as we can organise one. Your 2 day pass has no expiry date and can be used any time. We are planning more training dates soon. You can find out more about our training at https://crisisclassroom.com/training We'll also give you all the other perks - a message from the road, you'll be added to our Wall of Fame, an invitation to our party, and a live chat with the team from the road. Come and join the movement! * £5,059 in offline donations included in total.